To a recent culinary school grad or a professional chef, mise en place is as taken for granted as running water. But the concept of “everything in its place” before, during and after the production of food isn’t necessarily second nature if you don’t have a culinary background. That had been true for most of the foodservice staff at the Waterloo (Wis.) School District. But that’s changing, with an overhaul of a processed, same-every-week menu toward from-scratch cooking with a cycle menu and a new director who is introducing a whole new way of doing things in the kitchen. Irene Pawlisch was brought on as a consultant by the district at the end of last school year through a grant from the Greater Watertown Community Health Foundation with a goal to get more whole foods to kids. Soon after, the departure of the district’s foodservice director became an opportunity for Pawlisch to take the reins as director. Currently Pawlisch—who has a background developing menus for Taher—has been wearing many hats, including head cook. She’s prioritized mise en place as a jumping-off point to changing the kitchen culture to a team-oriented, coachable, happier and more productive one. Of course, change doesn’t come easily, not when it comes to school foodservice going to scratch cooking, anyway. After surveys and student taste tests toward the end of the year, boot camp last summer paired with a few “train the trainer” sessions with rock ‘n roll celebrity chef/consultant LJ Klink of Luck Junky Consulting set the stage for the changes coming to the kitchen this school year. The kitchen got upgraded equipment more geared to scratch cooking, but that didn’t mean that the staff was ready to use it to its full advantage. 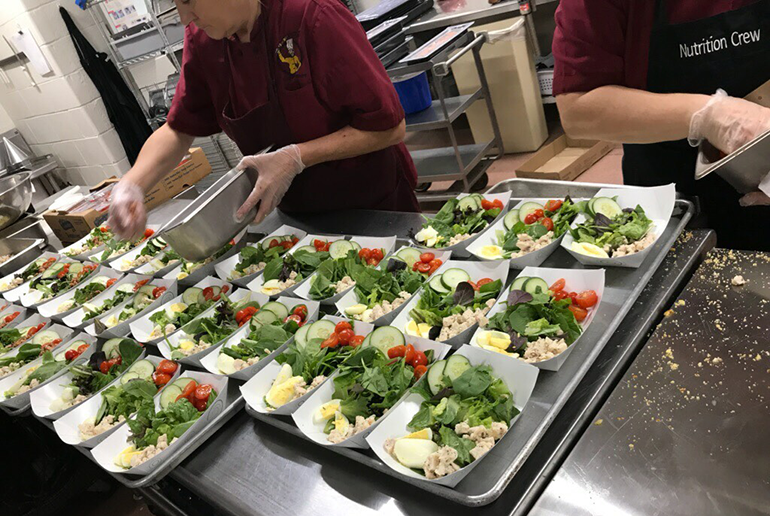 Even though “they’ve been doing it for years,” many staff members who serve just under 500 students per day for about $1.20 a meal, lacked food safety know-how, basic culinary knowledge and knife skills, Pawlisch says. Compounding that fact was the style of management in the kitchen prior to this overhaul. “It had been more of a one person calling all the shots environment, with the director basically doing everything, but now everyone has their piece of the pie that they’re focused on; it’s more of a team atmosphere,” Pawlisch says. “These ladies have been doing it this way for years and years and years and I’m working on helping them feel confident and comfortable to ask questions. “I want to have a coachable kitchen, and make use of peer coaching, where I show one person how to do something and they can pass it on to their neighbor,” she says. The first habit Pawlisch set out to change was the way the countertops resembled yours or mine at home—fine for making lunch for you and your family, but highly ineffective for making 40 sandwiches at once. So Pawlisch did some rearranging and showed the staff little changes—like using hotel pans instead of mixing bowls—that make things fit better on the countertop. The goal being to get that much closer to mise en place. With a clear, clean countertop, speedy, efficient production can begin. Pawlisch has made videos to show the setup and assembly process for items like turkey-BLT wraps to be used by staff (and other foodservice professionals). Living the mise en place life requires a shift in mindset, Pawlisch has found. Through the videos and hands-on instruction, the staff is learning that it makes more sense to use a tilt skillet the day before to make pasta, as opposed to rushing around and getting questionable results the day of with smaller kettles. Also, processes like cutting cantaloupe were addressed: instead of cutting the melon into wedges then skinning it, then slicing it, the better way is to skin it first then use a dicer for better food safety and quicker work. Also, more people on the line—each with a part of the assembly line for each item—means more teamwork. “Before you had one or two people making 100 salads, but you need to make it so multiple people can work on this table at the same time,” Pawlisch says. When a staff member finishes her first task of the day, she can go to a central bulletin board to find out what to do next, and that often means jumping in to help another staff member, building that teamwork culture that Pawlisch is after. Students at Waterloo were used to having the same thing every day of the week; while monotonous, it provided a certain rhythm they were used to. So when Pawlisch introduced a six-week menu rotation, she received some pushback from students, who weren’t used to needing to check the menu, because every Tuesday was Nacho Tuesday and every Monday was Pizza Monday since anyone could remember. And the comforting repetition of the week went back into place so students felt comfortable. Now, for example, every Tuesday is Mexican food, but not always nachos; it might be Mexican rice with refried beans. But by the second week of October, participation numbers had started to grow. Pawlisch has set a goal to serve 540 meals a day vs. the 470 meals-per-day baseline. And finally, there’s the people-skills aspect that’s so important. When making so many changes, Pawlisch had to stay cognizant of maintaining a respectful, polite vibe in the kitchen.